The Play:1 doesn't have Google Assistant or even Chromecast functionality (that's the similarly-named Sonos One), but it can stream music over Wi-Fi from Google Play Music, Spotify, Apple Music, and a bunch of other services using the Sonos app. You can buy two and pair them together in stereo, if you're so inclined, or incorporate them in your home theater setup. You can choose from black or white designs, both of which are fairly low-profile and should blend in just about anywhere you stick them, and Sonos refurbs come with a one-year warranty. If you've been wanting to break into the Sonos ecosystem and this deal speaks to you, don't sleep on it. This is a great price, and units are likely to sell fast. Missed your chance to pick up a Sonos Play:1 at these refurb prices when we first shared this deal with you a couple months back? 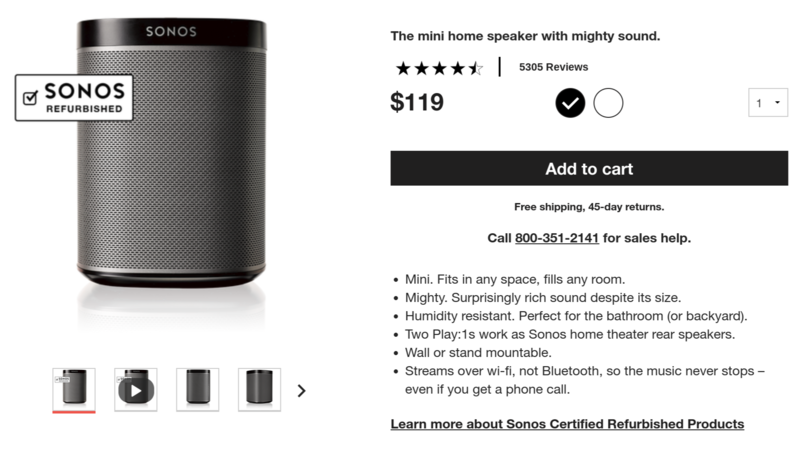 You're in luck, as Sonos has restored its stock and is once again selling refurbished units for just $119, or 20% below the brand-new cost. Both black and white speakers are currently available, but there's no telling how long that selection will last.